Located 25km north of Koh Bon is Koh Tachai (Tachai island). It’s about half way between the Similan Islands and Surin Islands and is often dived on the way to or from Richelieu rock. It is part of Mu Ko Similan National Marine Park. Koh Tachai diving is regarded as some of the best in Thailand and is a favourite with dive staff. Very strong currents can make dives in this area challenging. Visibility is usually good, between 20m-30m but can drop to less than 10m. There are several different places to dive around Koh Tachai and the most popular is Koh Tachai Plateau about 1km off the south eastern side of the island. There is a mooring buoy marking the site and it is usually necessary to use the line to prevent being swept away from the dive site by the current. The plateau is a scattering of rocks piled around each other that start at around 13m and drop down to past 35m. The rocks are covered with corals, sea fans, crinoids and anemones. Divers use the rocks as protection from the current as they weave their way around the site. Marine life on the plateau is exceptional. 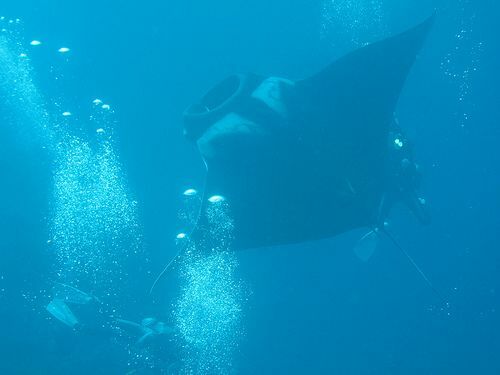 Divers come here because of the regular manta ray sightings. Whale sharks are also seen here. Leopard sharks are common as are barracuda, trevally and tuna. Hawksbill turtles can be seen and tiera batfish are often hanging out near the mooring line. Smaller stuff can also be found here when the big boys aren’t around. Koh Tachai has a myriad of nudibranch species and small frogfish can be found by the very observant. Just off the southern point of Tachai island are two submerged pinnacles that also attract manta rays and other large schools of fish. The rocks here create swim-throughs and crevices that are homes for the varied marine life. This is a deep dive with strong currents and is less frequently dived by Thailand liveaboards than the plateau. Off the eastern coast of Koh Tachai a long coral reef runs parallel to a stunning white sand beach. This is an easy reef that is often dived as a sunset or night dive.